A 63-year-old man presented to his primary care physician with gross hematuria and right flank pain that he had been experiencing for approximately two weeks. His past medical history was insignificant other than mild hypertension. There was no family history of malignancies. The patient admitted to consuming alcohol socially but did not smoke or have a history of illicit drug abuse. Routine urinalysis demonstrated gross hematuria. An electrocardiogram and a chest X-ray were performed and interpreted as normal. Routine blood work and metabolic panel also were normal, including the patient’s creatinine levels. Because of the hematuria and flank pain, the physician ordered a CT of the abdomen and pelvis. Figure 1 demonstrates a large heterogeneously enhancing solid mass arising from the upper pole of the right kidney. The mass has central hypoattenuation suggesting cystic changes or necrosis. 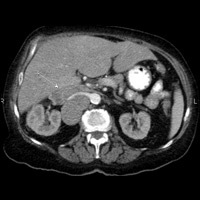 Figure 2 demonstrates a prominent dilated inferior vena cava (IVC) with an elongated tubular-shaped hypodensity, within the lumen, consistent with tumor thrombus. 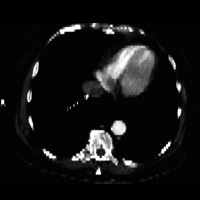 Figure 3 demonstrates a hypodense filling defect, partially occluding the suprahepatic portion of the IVC. Figure 4 demonstrates a similar density filling defect within the right atrium of the heart. • The incidence of RCC is approximately 80% to 90% of all renal malignant primaries in adults and up to 3% of all visceral malignancies. • The age of RCC presentation is usually in the 60s to 70s with a male to female ratio of 1.6:1. • Subtypes include clear cell (70% to 80%), papillary (10% to 15%), chromophobe (5%), and sarcomatoid (1.5%) carcinomas. • RCC is associated with von Hippel-Lindau syndrome, hemodialysis (the longer the duration of hemodialysis, the increase in risk), and tobacco use. • Staging indicates T1 lesion is less than 7 cm, T2 lesion if greater than 7 cm, T3 lesion extends into the perinephric fat but is contained within Gerota’s fascia, and T4 indicates invasion of adjacent organs. • Clinical presentation can be nonspecific, and RCC is often an incidental finding on imaging performed for a different reason. Symptoms can include hematuria, flank pain, weight loss, and fever. The classic triad of hematuria, flank pain, and a palpable mass is now seen in only a small minority of patients. • Diagnosis is usually made with ultrasound or CT. With the development and increased utilization of CT, there is limited indication for performing intravenous pyelogram. • Ultrasound findings include a hyperechoic or isoechoic solid mass. There may be cystic changes centrally but rarely calcification. • MRI findings include a low to medium signal on T1-weighted images and heterogeneous signal on T2-weighted images. RCCs usually enhance robustly with contrast, although several minutes delayed to normal renal cortex. 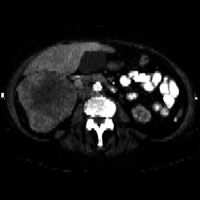 • CT is usually the gold standard and the imaging modality of choice for diagnosing RCC. Multidetector CT (MDCT) with multiplanar imaging greatly improves the ability to see these tumors in multiple planes, with thin sections, and at different phases with and without contrast administration. The noncontrast images usually demonstrate a homogeneous solid mass of increased attenuation (greater than 30 Hounsfield units [HU]), sometimes with calcification and stranding of the perinephric fat. After contrast administration, these masses demonstrate heterogeneous enhancement secondary to areas of cystic degeneration or necrosis. Greater than a 12 to 15 HU change between the precontrast and the postcontrast enhanced images is useful to confirm the diagnosis. The inherent vascularity of most RCCs characteristically produces strong enhancement of the mass during the corticomedullary phase of imaging (often in excess of 100 HU between pre- and postscans). • Renal vein thrombosis can occur in 4% to 25% of patients with RCC. Extension into the IVC can occur in 5% to 10% of people. The former is demonstrated by a low-attenuation-filling defect during the corticomedullary phase of imaging. Additional findings that suggest renal vein invasion include an abrupt change in caliber, the presence of collateral veins, and a heterogeneous enhancement pattern. One-half of the IVC thrombi are infrahepatic, and only 10% are located in the right atrium. • Radical nephrectomy with the removal of a thrombus from the IVC may be associated with major perioperative morbidity (up to 70%) and mortality (3% to 16%). The complication rates increase with the higher extension of the caval thrombus. The most common complication is significant blood loss. Prognosis depends mostly on tumor stage and histologic grade. Five-year survival by stage is 85% to 100% for stage 1, 45% to 65% for stage 2, 20% to 40% for stage 3, and 0% to 10% for stage 4. Metastatic disease can occur in approximately 25% to 30% of patients with RCC and is historically associated with a poor prognosis. Papillary-type tumors have the most favorable prognosis. Recurrent disease can occur in up to 40% of patients, and RCC usually recurs within two years of surgery. Recurrences can occur within the lung, bone, brain, surgical site, and contralateral kidney. Recent studies have shown that patients with renal vein or IVC invasion of disease, without extracapsular or perinephric spread of disease, have a similar prognosis as patients with stage 1 disease, following nephrectomy and thrombectomy. Patients with RCC invading the renal vein and/or IVC may have symptoms related to the vascular invasion, including lower extremity edema, a new right- or left-sided varicocele, dilated abdominal wall veins, pulmonary embolism, and proteinuria. While the extent of thrombus does correlate with the patient’s symptoms, the literature states that the extent of thrombus does not necessarily correlate with the outcome. — Laurence J. Spitzer, MD, is associate director of the department of radiology at Montgomery Hospital in Norristown, Pennsylvania. Hatcher PA, Anderson EE, Paulson DF. Surgical management and prognosis of renal cell carcinoma invading the vena cava. J Urol. 1991;145(1):20-24. Hoehn W, Hermanek P. Invasion of veins in renal cell carcinoma—frequency, correlation and prognosis. Eur Urol. 1983;9(5):276-280. Skinner DG, Pritchett TR, Lieskovsky G, Boyd SD, Stiles QR. Vena caval involvement by renal cell carcinoma. Surgical resection provides meaningful long-term survival. Ann Surg. 1989;210(3):387-394. Kallman DA, King BF, Hattery RR, et al. 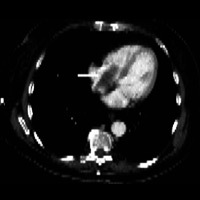 Renal vein and inferior vena cava tumor thrombus in renal cell carcinoma: CT, US, MRI, and venacavography. J Comput Assist Tomogr. 1992;16(2):240-247. Dyer R, DiSantis DJ, McClennan BL. Simplified imaging approach for evaluation of the solid renal mass in adults. Radiology. 2008;247(2):331-343. Chae EJ, Kim JK, Kim SH, Bae SJ, Cho KS. Renal cell carcinoma: analysis of postoperative recurrence patterns. Radiology. 2005;234(1):189-196. Dähnert W. Radiology Review Manual. 6th ed. Philadelphia: Lippincott Williams & Wilkins; 2007.